I'm so happy that Cranberries are officially in Season! I have several fresh cranberry recipes lined up to try. But figured I'd make the easiest sounding recipe first. I actually found a Cranberry Beef Stew recipe, and when you add the berries to the stew, they POP when it cooks! I will try that in a couple weeks. After making this bread, it confirms to me why I love cranberries! I was not expecting it to be as great as it was. This recipe is flying right into my recipe binder! It is a KEEPER! Lets put it this way, I made it yesterday mid-morning, and by today mid-afternoon, with three people in the house, there is only 1/3 left. Not super sweet so great with coffee. 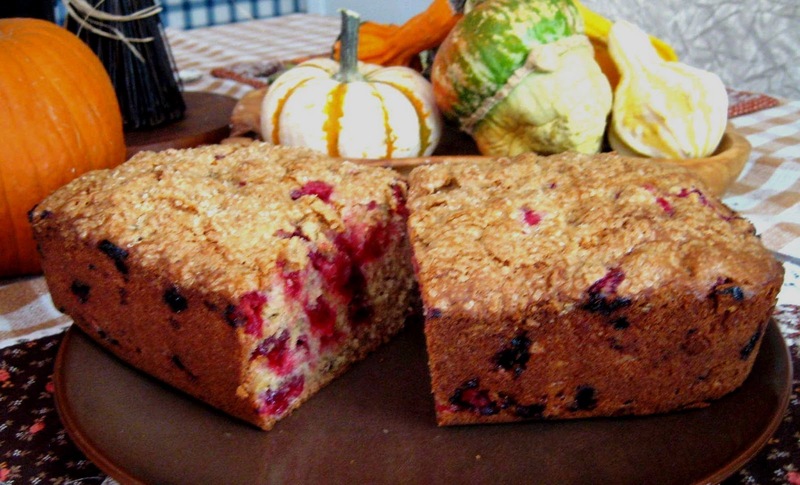 The FRESH cranberries give a perfect tart Zing. The top has a nice crunch, and with the raw sugar topping, it creates a great texture. Plus it's super pretty when you cut into it, and see the whole cranberries throughout. Wrap this up in Saran Wrap and it becomes a perfect gift for grandma, or a neighbor, or teacher, or as a hostess gift. It's just so pretty when you cut into it! 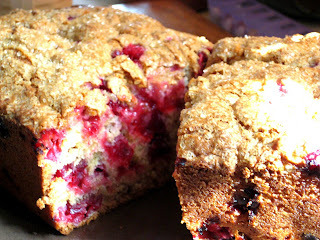 If you like Cranberry Scones (they are my favorite) then you will like this bread even better! Adjust oven rack to lower middle. Set to 350 degrees. With mixer, mix flour, brown sugar, baking powder, baking soda and salt. Make a well in the center of the flour mixture and pour in egg, butter and milk. Mix to combine. Take bag of cranberries and pour them into a separate bowl. Remove any that might look shriveled or bad. Pour entire bag of cranberries into batter and stir by hand to combine. Bake until top is golden brown and tester comes out clean from center. This should be about 50 to 60 minutes, but start checking around 50 minutes. Let cool a few minutes, run a knife around edges. It should come right out with ease since you greased and floured it, or used Bakers Joy. Let it sit at room temperate for at least an hour before trying it. It tastes way way better after it has totally finished cooling. Keep in a large zip lock bag for storing, or a container with lid. Can be left on the counter instead of refrigerating.